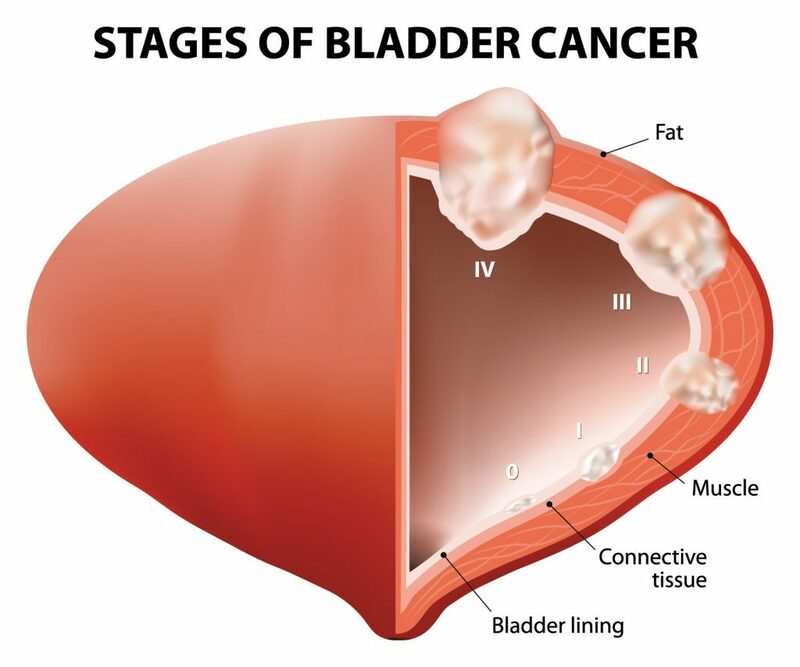 Bladder cancer is one of the most common forms of cancer. Statistically, it affects men more than women. Adults are more at risk to be affected, but it can happen at any point in life. Almost 7 out of 10 times, bladder cancer is detected in patients at an early stage. It is the point when it is highly treatable. At the same time, patients who have undergone treatment for bladder cancer successfully, need to follow up tests for years as it has a high probability to recur. The bladder is a hollow, membranous sac in the abdomen. Its function is to store the urine from kidneys for excretion. Bladder cancer develops when the cells of the bladder start to grow abnormally as opposed to growing and dividing in an orderly way. The wall of the bladder has many layers, and in most cases, cancer begins in the innermost layer. As time goes by, cancer spreads to other layers and becomes harder to treat. Blood in the urine. Most of the times it is not painful, but it is one of the most prevalent symptoms amongst patients. Cancer can cause a change in urinary habits, such as frequent visits to the bathroom but small amounts of urine. Bladder cancer can be the reason behind frequent UTIs or urinary tract infections. Dysuria, i.e., pain, discomfort or burning while urinating. It is known that Bladder cancer is more common in men along with prostate and testicular cancer, but dysuria is more common in women. These symptoms are not exclusive to bladder cancer and may at many times be indicators of other problems, such as infections or stones in the kidney/bladder. Most of the times, the blood in the urine is not visible and needs to be tested. If the urine changes color beyond just a slight change in shade, or it is bright red, you need to seek a medical professional immediately. When the cancer cells form a mass, they are called a tumor or cancer. These cells can spread to other areas of the body through metastasis. It is a process in which the cancer cells destroy the local tissues, and the fluids from these tissues become a passage for the cancerous cells to spread through the lymphatic system or the bloodstream where they can stop off at other organs/tissues and destroy them. Preventive measures and early detection is the key to defeat the disease. Contact us today to schedule an appointment with the best Urologist doctor in NYC.